"You may say that she was my ideal, if you were some sort of sickening long-haired poet." Col. Blimp was a creation of British cartoonist David Low in 1934, and he rapidly came to symbolize right-wing stupidity and military blockheadedness. Little of that, however, survives in the affectionate Archers' production surveying a military officer's career, and how he might end up as a slightly comic and out-of-date figure. 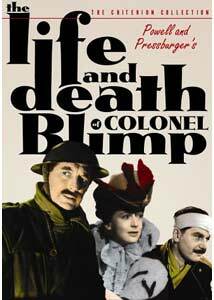 The film follows Clive "Sugar" Candy (Roger Livesey), an officer in the British Army, from 1902 through 1942. The structure features three flashbacks. In the first, Candy defies his superiors and goes to Germany in 1902 to deal brashly with a German who is propagandizing against Britain. On the way he meets and falls for Edith Hunter (Deborah Kerr), but loses her to a dueling opponent, Theo Kretschmar-Schuldorff (Anton Walbrook). The second flashback is to the closing days of World War I and shortly thereafter, when Candy briefly meets a double for Edith, a nurse named Barbara Wynne (Kerr again), whom he marries. The final flashback is to the late 1930s, when despite looming war with Germany, Candy stands as sponsor to the now-widowed refugee Theo. At the same time, he struggles to come to grips with the notion of total war, and is unable to adjust to a style of war that does not involve good manners and protocol. It was the latter theme that caused political trouble for Blimp, for Winston Churchill and the Conservative government took umbrage at the suggestion that there were such Blimps in the British Army, and even more so that a British officer might have a lifelong friendship with a German military man. But Churchill was being far too sensitive; unlike Low's savage attacks on his cartoon Blimp, the film's treatment of Col. Candy is suffused with romance and thoroughly sentimental. The picture seems to have very mixed messages, for its Blimp is meant to be an object of derision (otherwise the name would not have been borrowed), but it's hard to take that position seriously in the way that the film unfolds. Indeed, much of the time it almost seems as if the film's sympathies are firmly opposed to the new army and its need to work outside the lines and to fight the Nazis on their own savage terms. The flashback structure seems to indicate that the new army mode is the one to be followed, and this is confirmed by Powell in the commentary. One wonders, however, whether such a reading could have been really thought through; certainly Powell and Pressburger would have found turning to fascism (a solution the cartoon Col. Blimp probably would have endorsed) or resorting to genocide as truly being an acceptable means of fighting a war. These are questions that are as timely as ever today. Roger Livesey, a Powell & Pressburger regular, turns in a splendid performance as Candy, through a variety of ages. Despite being burdened with an unconvincing age makeup, he nonetheless convinces absolutely as the bloated 70-year-old colonel taking refuge in the Turkish baths. Anton Walbrook as the recurring friend is Livesey's equal, making speeches that are horribly overwritten sound sincere and heartfelt. A 21-year-old Deborah Kerr here takes on her first leading role (or more specifically, three of them) with aplomb. The three women she plays are all quite different, and indeed she's often hardly recognizable as the same person, particularly in the slow reveal of the third role, which I won't spoil here. Cinematically, the picture has numerous intriguing features. Most notable is a clever montage to show the passage of time between flashbacks through the addition of mounted animal heads to the walls of Candy's den. The sequence of the buildup to the duel, with its elaborate protocols, is obviously the source of the real fascination to the filmmakers; when the duel actually begins, the camera pans up to the rafters and through the roof, indicating a distaste for the duel itself. In all, the picture is quite attractive throughout, with an interesting structure (in its restored form; the original US releases cut over an hour from the running time) and first-rate acting. Recommended. Image Transfer Review: The full-frame transfer is taken from the Technicolor restoration by the British Film Institute, and overall looks fabulous. The Technicolor splendor is restored, with vivid colors that are often eye-popping (notably the reds and blues of the German officers' uniforms). There are occasional unimportant speckles; I did spot three nasty ragged tears, which is unusual for a Criterion presentation; usually such problems are resolved digitally. Black levels are very good, though shadow detail is a bit plugged up. Textures and details come through quite nicely, perhaps more than intended, since it renders the flaws in the age makeup impossible to notice. Grain structure is retained, giving the picture a nice filmlike appearance. Audio Transfer Review: The 1.0 mono score is unfortunately typical for British film of the 1930s and 1940s, which is to say there is a tremendous amount of noise and crackle. Livesey's hoarse voice is often at a frequency and in a character that blends in with the noise, so it was probably impossible to attempt to filter out the noise without muting Livesey completely. The music has a tinny and compressed sound to it much of the time as well. The audio isn't good, but alas it's probably not likely to be any better. Hence the slightly higher grade than might have otherwise been thought applicable. Extras Review: The disc features the 1988 commentary from Criterion's laserdisc release of the film, with the aged Powell speaking briefly about the picture, and Martin Scorsese, who greatly admires the picture, providing most of the enthusiastic comments on the style and technique. As things go on, Powell warms a bit to the task, but there are lengthy gaps of silence on the commentary. Still, it's good to hear from the director himself. The commentary is supplemented by several text essays in the accompanying pamphlet, including an interesting excerpt from Low's autobiography regarding the inception of the film. Also provided is a more recent documentary about the film, apparently an episode from a television series, running 24m:02s. This tends to duplicate much of the information given on the commentary, though it does provide more background on the political controversy engendered by the film. A gallery of about 90 stills is included, and they are well-captioned. Wrapping up the package is a set of several dozen Col. Blimp cartoons from David Low that give a glimpse of the more hostile take on the character that was part of the public mindset, and no doubt part of why Churchill had the film banned in Britain and tried to suppress its export as well. A slightly sentimentalized look at one man's life in the British military, with a gentle warmth and wit, with some interesting technique and excellent performances throughout.